Explore the ancient port city of Tulum and get your thrills on an ATV adventure in the Mayan jungle. 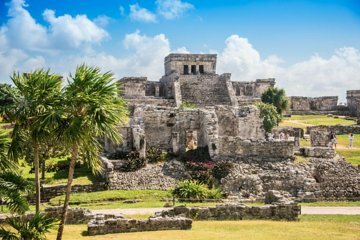 After a convenient hotel pickup, travel to Tulum and learn about its impressive seaside ruins from an informative guide. Hop on an ATV, cruise along jungle trails, and visit an underground cenote (a natural sinkhole filled with clear refreshing water) during this fun and exciting excursion.